Vancouver, Nov. 10, 2016 | UrtheCast Corp. (TSX:UR) (“UrtheCast” or the “Company”) today announces financial results for the three and nine months ended on September 30, 2016. The Company is pleased to report Q3 non-IFRS revenues of $15.5 million, a 68% increase over Q3 2015 non-IFRS revenue of $9.3 million. IFRS revenue for the quarter was $20.7 million, a 37% increase over the $15.0 million reported in the same period last year. 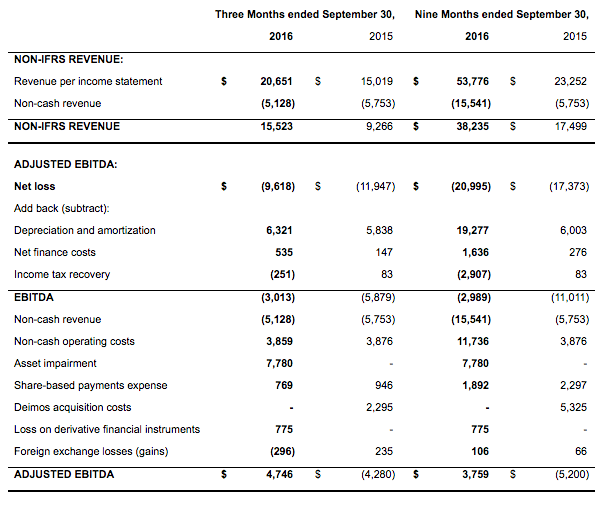 Similarly, the Company’s non-IFRS adjusted EBITDA was positive $4.7 million in the quarter compared to a loss of $4.3 million in the same quarter of 2015, amounting to a $9 million improvement for Q3 in year over year adjusted EBITDA. At September 30, 2016, the Company had total cash balances of $21.0 million and working capital of $22.4 million. Revenues in the Company’s earth observation (EO) business in the quarter grew by 129% compared with Q2 2016, growing from $3.1 million to $7.1 million (non-IFRS reporting). The Company continues to pursue opportunities for our technology and engineering business. Though not limited to our Synthetic Aperture Radar (SAR) technology, it is our SAR IP in particular which is creating a lot of new commercial opportunities, both in Canada and internationally. The Company has now filed 5 patents relating to the OptiSAR technology, some of which have now reached the publication stage. During the quarter, the Company recorded a non-cash asset impairment charge of $7.8 million for the ISS cameras due to a slow revenue ramp, ongoing operational and geopolitical challenges, and our ISS partner informing us of their intention to renegotiate a new agreement with UrtheCast going forward from January 1, 2017. The Company is now in active discussions to monetize our ISS cameras through alternative means, including licensing arrangements. The ramp-up in EO revenues in 2016, from $1.3 million in Q1 to $3.1 million in Q2 and $7.1 million in Q3, allows us to reaffirm our guidance for 2016. In parallel, UrtheCast has been expanding its EO portfolio to include imagery from other satellite imagery providers, including those of the PanGeo Alliance, of which we are a founding member. The capability of UrtheCast to offer an integrated virtual-constellation service, which goes much beyond a simple reseller offer, is allowing us to access new markets and customers with a value proposition which is highly demanded. The sales ramp for high-resolution imagery data (Deimos-2) is mainly in Europe, Latin America and Asia across a number of market verticals, where our sales network has been working for a longer period. Deimos-2’s exceptionally fast turnaround times and our flexibility in adapting to customers’ service needs are the key differentiating factors of our product offering. Sales of medium-resolution imagery (Deimos-1) are still growing, with legacy customers maintaining or increasing their orders and new customers signing for services in new geographies. This growth can be achieved despite the competition of free data (mainly US Landsat-8 and EU Sentinel-2), thanks to the unique service level of the UrtheCast product, which is also tailored to enable sustainable geo-analytics services. The Company is actively negotiating contracts with multiple partners to bring to market the UrtheDaily constellation, which has been designed to be the world’s first Earth Observation system planned, from the ground-up, to truly power machine-learning and artificial intelligence-ready geoanalytics applications on a global scale. Customers’ urgency for the UrtheDaily service is being created in part by the impending end-of-life of incumbent satellite systems. The Company met with several key stakeholders within the supply chain for the procurement of the satellites, further refining the design, cost and timing of delivery and launch. The Company is in full contract negotiations with three prospective OptiSAR customers to convert existing Memoranda of Understanding, representing in total US$490 million of customer commitments for the constellation. If successful, this will allow us to begin building the first series of satelites. The Company is witnessing increasing financial support and user interest from the Government of Canada in OptiSAR, the world’s most advanced SAR technology. The company is pursuing this because the Canadian Government is looking at a follow-on mission to the three-satellite RCM program (RADARSAT Constellation Mission). UrtheCast’s Request for Proposal (“RFP”) to U.S. companies interested in a long-term strategic partnership to serve the United States Government has closed and the Company is reviewing the responses submitted. At this time, the Company is inviting down-selected U.S. bidders for partnership discussions. This continued significant year over year growth allows us to reaffirm our full year 2016 guidance to achieve non-IFRS revenue between $55 million and $60 million (representing an IFRS revenue range of $78 million to $83 million) and non-IFRS adjusted EBITDA guidance between $4.2 million and $6.2 million in fiscal 2016. 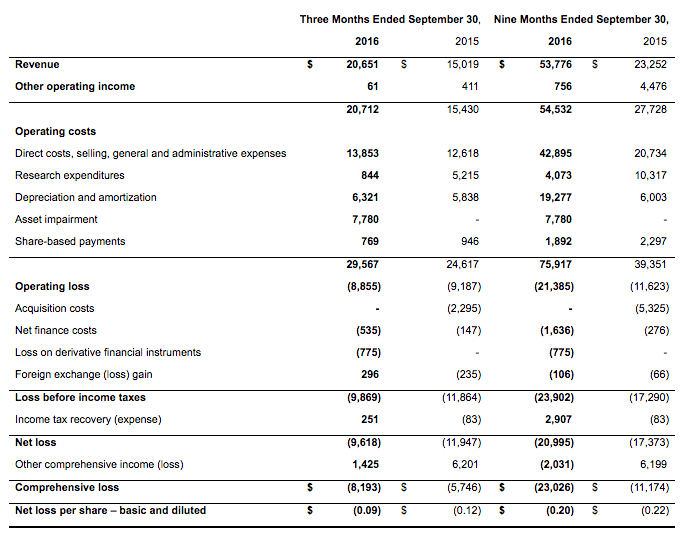 The following table provides selected financial information of the Company, which was derived from, and should be read in conjunction with, the unaudited consolidated financial statements for the three and nine months ended September 30, 2016. As previously announced, UrtheCast will host a conference call regarding its 2016 third quarter financial results at 5:00 p.m. ET (2:00 p.m. PT) today, November 10, 2016. The live conference call will be available by calling toll-free at +1 866-696-5910, or by toll call at +1 416-340-2217. The participant pass code is 6974365. This release contains certain information which, as presented, constitutes “forward-looking information” or “forward-oriented financial information” within the meaning of applicable Canadian securities laws. Forward-looking information involves statements that relate to future events and often addresses expected future business and financial performance, containing words such as “anticipate”, “believe”, “plan”, “estimate”, “expect” and “guidance”, statements that an action or event “may”, “might”, “could” or “will” be taken or occur, or other similar expressions and includes, but is not limited to, statements relating to: UrtheCast’s expectations with respect its current sensors and proposed OptiSAR™ and UrtheDailyTM constellations; financial guidance for the 2016 financial year; anticipated cash and financing needs; its plans for and timing of expansion of its product offering and value-added services, including providing additional data sources on the UrthePlatform; its future growth and operations plans, including with respect to the RFP; expectations regarding its sales funnel; significant changes expected in 2017 to the agreement with our Russian partners related to the cameras aboard the Russian segment of the International Space Station (“ISS”); efforts to monetize the cameras aboard the ISS through alternative means; management’s expectations regarding recoverable amounts of such assets; and anticipated trends and challenges in its business and the markets in which it operates. Such statements reflect UrtheCast’s current views with respect to future events. Such statements are necessarily based upon a number of estimates and assumptions that, while considered reasonable by UrtheCast, are inherently subject to significant uncertainties and contingencies. Many factors could cause UrtheCast’s actual results, performance or achievements to be materially different from any future results, performance, or achievements that may be expressed or implied by such forward-looking statements, including, among others: any delays or failures in the design, development, construction, launch and operational commissioning of the proposed OptiSAR™ or UrtheDailyTM constellations; the Company being unable to convert the Memoranda of Understanding in respect of funding of the OptiSAR™ constellation into binding, definitive agreements; failures aboard the International Space Station (“ISS”) or the Deimos-1 or Deimos-2 satellites; failure to obtain, or loss of, regulatory approvals; uncertainties and assumptions in UrtheCast’s revenue forecasts; as well as those factors and assumptions discussed in UrtheCast’s annual information form dated March 29, 2016, (the “AIF”), which is available under UrtheCast’s SEDAR profile at www.sedar.com. Forward-looking information is developed based on assumptions about such risks, uncertainties and other factors set out herein, in the AIF, and as disclosed from time to time on UrtheCast’s SEDAR profile. UrtheCast undertakes no obligation to update forward-looking statements except as required by Canadian securities laws. Readers are cautioned against attributing undue certainty to forward-looking statements.